Glazing and lighting are two vital factors when it comes to energy usage. In 2011, in an endeavour to make our buildings more sustainable, and to decrease energy usage in South Africa, a new part was added to SANS 10400, The application of the National Building Regulations. Part X deals with environmental sustainability, and Part XA deals with energy usage in buildings. In many ways these new regulations have turned the building industry upside down, but not in a bad way. However for the average man-in-the-street it has become a puzzle of note. Every week we get people writing into this web site asking for advice and information about the “new energy laws” and how they affect their building and renovations. On the down side, it seems that new regulations have opened up a can of worms that has less-than-knowledgable people (and some scamsters) flippantly quoting “the new green laws” in an effort to force people to spend more money than they need to on energy-efficient materials, appliances and the like. While there is no doubt that we need to “go green” and get our act together (pun intended) in terms of energy efficient building, it is also important to know the difference between what we should do, and what we must do to comply with the National Building Regulations and other national standards. While the Act was originally passed in 1977 (officially it’s Act 103 of 1977), a number of amendments have been added to it over time. In 2011, Rob Davies, the Minister of Trade and Industry added the sections that relate to environmental sustainability and to energy usage in buildings. A1 – Entertainment and public assembly Occupancy where persons gather to eat, drink, dance or participate in other recreation. A2 – Theatrical and indoor sport Occupancy where persons gather for the viewing of theatrical, operatic, orchestral, choral, cinematographical or sport performances. A3 – Places of instruction Occupancy where school children, students or other persons assemble for the purpose of tuition or learning. A4 – Worship Occupancy where persons assemble for the purpose of worshipping. C1 – Exhibition hall Occupancy where goods are displayed primarily for viewing by the public. C2 – Museum Occupancy comprising a museum, art gallery or library. E1 – Place of detention Occupancy where people are detained for punitive or corrective reasons or because of their mental condition. E2 – Hospital Occupancy where people are cared for or treated because of physical or mental disabilities and where they are generally bedridden. E4 – Health care Occupancy which is a common place of long term or transient living for a number of unrelated persons consisting of a single unit on its own site who, due to varying degrees of incapacity, are provided with personal care services or are undergoing medical treatment. F1 – Large shop Occupancy where merchandise is displayed and offered for sale to the public and the floor area exceeds 250 m2. F2 – Small shop Occupancy where merchandise is displayed and offered for sale to the public and the floor area does not exceed 250 m2. F3 – Wholesalers’ store Occupancy where goods are displayed and stored and where only a limited selected group of persons is present at any one time. G1 – Offices Occupancy comprising offices, banks, consulting rooms and other similar usage. H1 – Hotel Occupancy where persons rent furnished rooms, not being dwelling units. H2 – Dormitory Occupancy where groups of people are accommodated in one room. H3 – Domestic residence Occupancy consisting of two or more dwelling units on a single site. H4 – Dwelling house Occupancy consisting of a dwelling unit on its own site, including a garage and other domestic outbuildings, if any. H5 – Hospitality Occupancy where unrelated persons rent furnished rooms on a transient basis within a dwelling house or domestic residence with sleeping accommodation for not more than 16 persons within a dwelling unit. But they specifically EXCLUDE garage and storage areas contained within these specified occupancies, as well as a number of other buildings that are used for commercial, industrial and buildings used exclusively for a variety of storage uses. have a “building envelope and services” that facilitate the efficient use of energy that is appropriate to the function and use of the building as well as its geographical location and its internal environment. So it is not a one solution fits all situation. For instance, what works for a house in Durban may not make the same structure energy efficient in Cape Town! In addition, the legislation excludes the “equipment and plant” required for conducting business – if the building is used for business. XA2 requires that at least a half – “50% (volume fraction) of the annual average hot water heating requirement shall be provided by means other than electrical resistance heating including but not limited to solar heating, heat pumps, heat recovery from other systems or processes and renewable combustible fuel”. So you can use a conventional geyser IF you meet the 50% requirement. And if you are renovating, you certainly don’t have to toss all your existing water equipment and go solar – even though there is absolutely no doubt that it’s the way to go. The orientation, shading, services and building envelope must be designed according to SANS 10400 Part XA. Alternatively the rational design of the building must be done by a competent person who “demonstrates that the energy usage of such building is equivalent to or better than that which would have been achieved by compliance with the requirements of SANS XA, or has a theoretical energy usage performance, determined using certified thermal calculation software, less than or equal to that of a reference building in accordance with SANS 10400 Part XA”. If you’re looking to change jobs, becoming a person competent to specify these requirements is one way to go! It is something that is not easy for someone who hasn’t got the relevant training to get their head around. As with all national standards, 10400 XA has a number of definitions, some of which are in the glossary that is part of the Act. 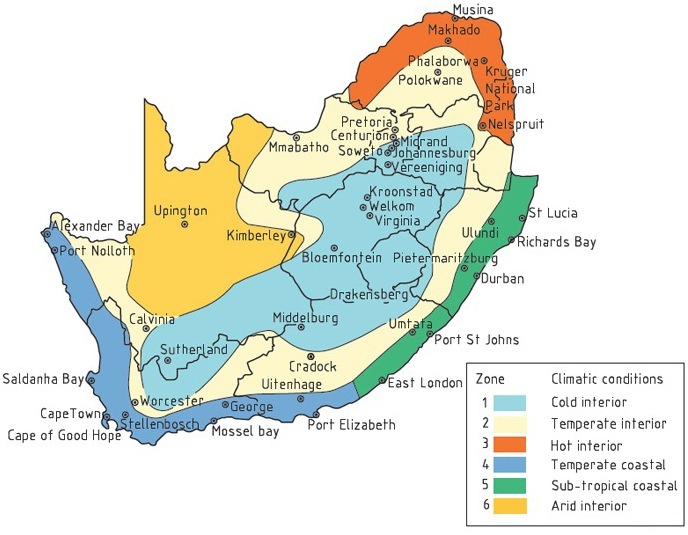 The standard also defines the different climatic zones of South Africa. This is probably the most vital part of the new regulation, and it addresses orientation, floors, external walls, fenestration, and roof assemblies – but not in a lot of detail. If any type of underfloor heating system is used in a home, this must be insulated under the concrete slab with insulation that has a minimum R-value of at least 1,0. The R-value is the thermal resistance (square metre K/W) of a component. According to the Standard, it is “the inverse of the time rate of heat flow through a body from one of its bounding surfaces to the other surface for a unit temperature difference between the two surfaces, under steady state conditions, per unit area”. Any roof assembly must achieve a minimum R-value for the direction of heat flow. This is specified in several tables in the regulations. Roofs with metal sheeting affixed to purlins, rafters or battens made of metal are required to have a thermal break that consists of a material with an R-value that is not less than 0,2, and which is installed between the sheeting and the support. In addition, roofing assemblies that utilize metal sheeting must achieve a minimum total R-value that meets the requirements shown in the table above. Insulation must also be installed with an R-value that meets the specified in the table below. Clay tiles used for roofing must achieve a minimum R-value as in the first table above. Insulation should be in accordance with the specifications shown below. 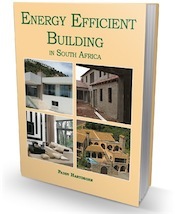 SANS 204 (2011): Energy efficiency in buildings. If you use accredited software that guides you through the process and spits out a report afterwards do I still need a competent person to do the work? Can anyone advise on which software has been accredited for the rational energy design and is a gas heater considered an alternative to solar and the heat pump alternative. 4.5.2.3 Hot water usage should be minimized and the system maintained in accordance with the requirements given in SANS 10252-1. 4.5.2.4 All exposed pipes to and from the hot water cylinders and central heating systems shall be insulated with pipe insulation material with an R-value in accordance with table 13.
b) be able to withstand the temperatures within the piping, and c) achieve the minimum total R-value given in table 13. PLUS a whole lot more about piping and insulation. A gas heater is acceptable as alternative heating, as it does not use any electrical resistance heating. Regarding gas water heating, it is my personal view that it is in conflict with the primary purpose of energy efficiency legislation in South Africa which is to reduce greenhouse gas emissions. I think most local authorities wouldn’t raise an issue with gas heating because it clearly is not “electrical resistance” heating and you’ll probably find most consultants offering that service would also not make an issue regarding LPG based heating. Please don’t shout Trevor. We don’t charge for information and so have to answer queries in our spare time. In any case we don’t have any information about software. Try Google or someone who offers rational design services in SA. Does anyone have calculation for Heat Pumps to comply with 100% Energy Efficiency? Hi. Please let me know what the regulations are with regards to using gas cylinders in a block of flats. I would like to know about size of cylinders etc. Is there a document that can be forwarded to me. Also what are the laws for an evacuation plan for a block of flats with 64 apartments. I am sure there are Farida, but not as part of the National Building Regulations. I suggest you contact the SABS (one of their libraries) and ask them to do a search to see what standards apply to gas cylinders. As far as an evacuation plan is concerned, this is a fire issue. Your local fire department should be able to refer you to someone who has the necessary knowledge. Again, it is not something that is covered by the NBR. SANS 10400 Part T: Fire Protection covers escape routes, exit doors etc. not HOW to evacuate. Are you allowed to build a home theatre with no windows? Hi Pieter, I am sure that you can so long as there is adequate ventilation designed into the room and there are also adequate safety exit routes out of the “theatre”. A example in many buildings are the toilet facilities that have no windows but have plenty of ventilation channels and fans built in.